The First International Symposium of Modern Anesthesia History was held in Rotterdam in 1982. 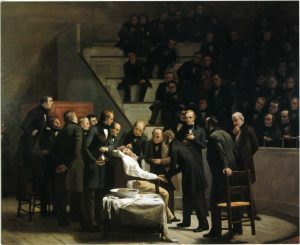 At that meeting, several members of the American Society of Anesthesiologists (ASA) discussed the possible organization of an anesthesia history society in the U.S. Following up on this, a group of 47 met on October 25, 1982 at the Annual Meeting of the American Society of Anesthesiologists (ASA). The meeting was chaired by Dr. Garth Huston, then Chiarman of the Board of Trustees of the Wood Library-Museum of Anesthesiology (WLM). Various names for the new group were discussed. By January 1983 the name “Anesthesia History Association (AHA) was agreed upton. Dr. Selma Calmes and Dr. Roderick Calverly are credited as co-founders of the AHA. The “Inaugural Meeting” of the AHA was held on October 9, 1983. This, like the organizational meeting and all subsequent annual meetings of the AHA, was part of the program of the ASA Annual Meeting. Having begun under the aegis of the ASA, there was at first some confusion regarding the status of the AHA. However, the AHA soon established its own autonomy, and in October 2006 formally became a “501(3)c” corporation registered in Illinois. The first issue of the “Anesthesia History Association Newsletter” was published in December, 1982. It has remained in continuous publication, with an average of four issues per year (see the following list). In 1995, the WLM became co-publisher of the newsletter, a relationship that continues to the present. With the July, 1995 issue, the name of the newsletter was changed to the “Bulletin of Anesthesia History”. In 1996, a cumulative index of the AHA Newsletter ws published. Creation of the index was a joint project of the AHA, WLM, and ASA. The AHA was a principal sponsor fo the Third International Symposium on the History of Anesthesia The meeting was held in Atlanta, Georgia, March 27-31, 1992. The theme of the symposium was the Crawford W. Long Sesquicentennial, the 150th anniversary of Dr. Long’s use of ether vapor to produce surgical anesthesia. The AHA also co-sponsored the Bicentenary Meeting to mark Davy’s Researches into Nitrous Oxide, held in Bristol, England, May 13-15, 1999.